President Donald Trump warned Tuesday that the United States is ready to "totally destroy" North Korea and vowed to confront Iran's "murderous regime" over its weapons program. 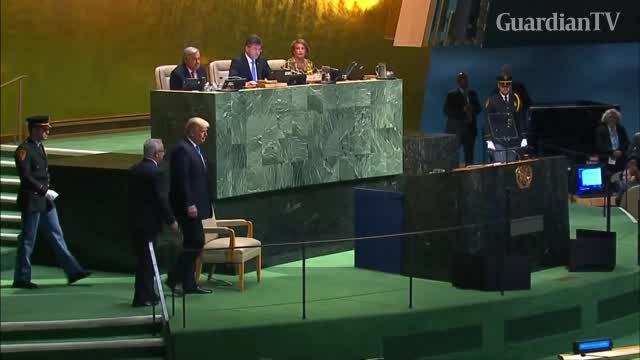 In his first address to leaders gathered at the United Nations General Assembly, Trump warned North Korea not to pursue its nuclear missile program in his starkest language yet, deriding its young leader Kim Jong-Un with the nickname "Rocket Man" and threatening to end his country. "The United States has great strength and patience, but if it is forced to defend itself or its allies, we will have no choice but to totally destroy North Korea. Many of the assembly's members, including US allies and Iran deal signatories France and Britain, favor retaining the accord -- under which Iran surrendered much of its enriched nuclear fuel and exposed its nuclear sites to international monitors. But some of Trump's closest advisors fear the agreement leaves Iran too close to the threshold of being able to quickly develop a nuclear weapon when restrictive clauses in the deal begin to expire in 2025.